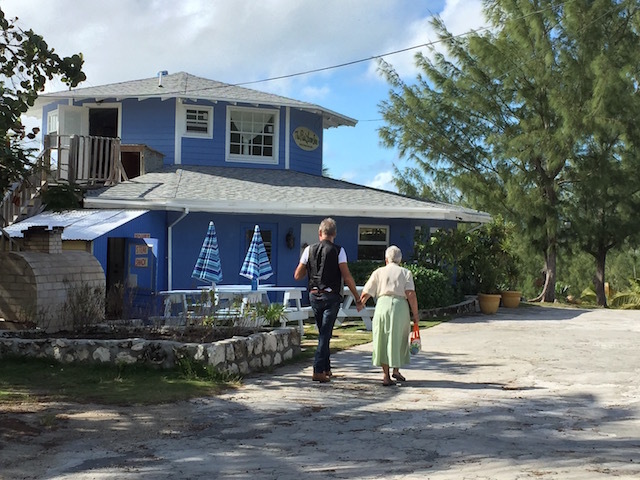 This week we pay a visit to Rainbow Inn – next to feature in the Best of Eleuthera series…. Richard and Rhonda Waserman along with their son Zev and his lovely wife Mish Lavagnino run the Rainbow Inn in Rainbow Bay. They specialize in the freshest fish – never frozen – along with great steaks and on Monday nights pizza cooked in their special outdoor pizza oven. Richard, Rhonda and Zev are from Ottawa, Canada and Mish is from Perth Australia – so they make a great team bringing together the best from both cultures. They have been at the Rainbow Inn since 2007 and have steadily built up a great business and a loyal following. They are always welcoming and make you feel like one of the family…. Last year Mish had a year off following the birth of their son – but now all 4 are back in force and ready for a busy season. Zev is chef and Richard also helps out on the grill – check out Richard’s steak shack ….. They are open six days a week. Monday nights are Pizza night as I said, Tuesday’s they are closed for a well earned day off and then from Wednesday through to Sunday they are open from breakfast time – 7.30 am until they close at night. So you can sample breakfast, lunch or dinner from Wednesday to Sunday. They also have live music 3 nights each week…. Jules Carey at the piano !!! Mish also runs Boy Meets Girl Weddings and does private catering in her spare time !! She catered for Eleuthera resident Lenny Kravitz and also Mariah Carey as well. Click on the link to see some of her great wedding pictures. Rainbow Inn also has accommodation – 4 studios and a 3 bed 3 bath house all available for rental. Now most importantly on to the food ! As I said previously they specialize in the freshest caught fish as well as steaks. They always have a strip steak on the menu but you can call ahead to pre-order a 22oz bone in ribeye or an 8oz filet. They also have an organic vegetable garden – so all the salads come fresh from the garden. Tomatoes to soon follow ! We ate Sunday lunch there with some friends and enjoyed between us conch fritters, fabulous coconut fish bites, fish cakes , caprese salad, jerk chicken wraps, great fries !, grilled vegetables, steak and mushroom sandwich and blackened grouper. Followed by pumpkin cheesecake ! The very hardworking family always push the boat out for celebrating the holidays and this year is no exception. Christmas Eve will feature a family dinner, Christmas carols performed by the local church choir and a special appearance by Santa ! New Year’s Eve will feature Junkanoo, a fire breather, limbo dancing – a special menu, fireworks and much more ! Call on 242 335 0294 for reservations…..
We’ll be at Rainbow Inn in two weeks. So glad they’re open for the season. I took so long to do this you are here now !!!! Great blog about Rainbow. We live in Rainbow Bay and love going to the inn. You are correct they do make everyone feel welcomed and they serve great food. Love all of your blogs and have learned a lot from them. Thanks! Pleased you like the blogs…..
Love to visit when I am in town to see my son. Rainbow is my favorite spot, very hamish, or homey!!!!! !